If you were a British teenager in the 70’s there were a select number of bands who seemed to appeal to everyone. Rockers with enough Pop for the teenies but also enough stomp for the ‘serious’ music fans. 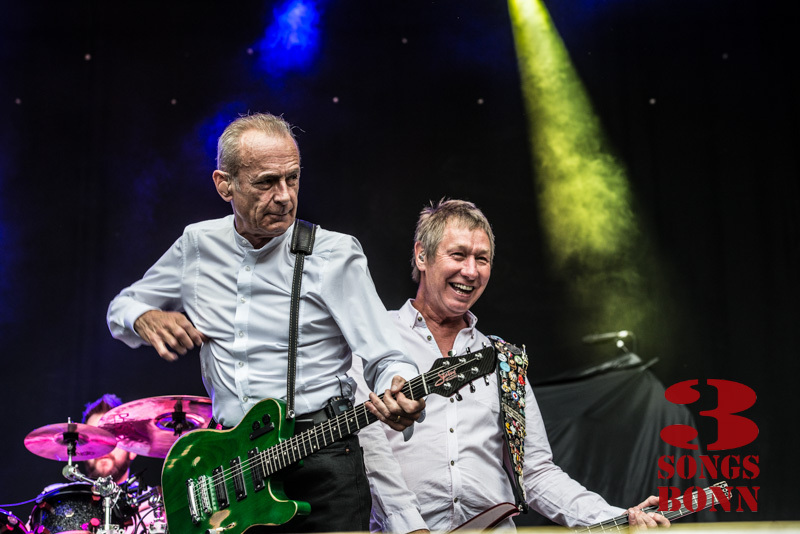 That ‘something for everyone’ appeal at the time has proved to be timeless, as evidenced by the appearance on Thursday of two giants of the era – Status Quo and Alice Cooper on a double bill at Bonn’s Kunst!Rasen. The full story of this show involves, for me, a journey back to the end of August 1987. A colleague at work in Portsmouth was planning to head up to Reading for the Festival’s 25th Anniversary Year. We had neither a tent nor the necessary ready cash for both days so a decision had to be made: Saturday with ‘The Quo’ and The Georgia Satellites or Sunday with a bill topped by The Stranglers and Alice Cooper. Eventually we settled for Saturday with the extra promise of Canadian heavy metal darling Lee Aaron and a favourite Blues band of mine ‘Blues n Trouble’ – who didn’t appear, for reasons I never ascertained. Here I am 28 years later and the perfect compromise: Status Quo and Alice Cooper on the same bill, on the same day, and no hour long wait for a portaloo. So, The two headliners from one of Britain’s finest Rock Festivals in one evening – and a disappointing crowd of maybe 2500 people (if crowd is the correct word for an arena holding 9000). I don’t think there was any dispute that Cooper’s theatrics would mean his being the second to go on – Daylight isn’t the time to be welcomed to a nightmare. It seemed though that when Parfitt, Rossi and co stepped onstage to blast into ‘Caroline’ that the entire audience was wearing Status Quo T-shirts. Did they all have a Cooper one on underneath to switch round later I wondered? Current talk in the media is that Rossi is close to calling it a day just short of a 50th Band Anniversary. He certainly looked anything but disenchanted with live music from where my camera stood. He posed for a moment and moved on just before you pushed the shutter button – only to look down the lens scratching his chin with a huge grin. Rick Parfitt also looked to be having a great time. 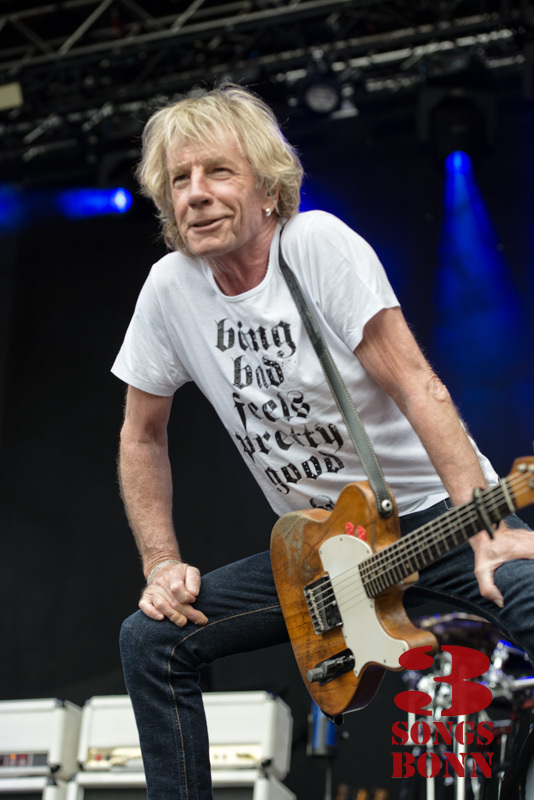 Despite major heart surgery in the past and a heart attack in 2014, Parfitt looked full of youthful vigor. The ravages of time have meant a change of lifestyle and an end to smoking and drinking, but it doesn’t stop him wearing a T-shirt this evening proclaiming ‘Being Bad Feels Pretty Good’ . The biggest smile of all seems to be perpetually on the face of bassist John ‘Rhino’ Edwards, and he certainly stood out, literally, from the quiet Andy Bown on keys and occasional but enjoyable blues-harp. I shouldn’t forget Leon Cave who’s bass drum looked rather barrel like – seeming rather small and only allowing room for an ‘SQ’ on it’s front – but despite this, reaching reassuringly back to produce the required Quo ‘thump’! As a long time Quo, fan even I have to admit it’s hard to tell when‘Break the Rules’ ends and ‘Roll over Lay Down’ begins, but I would miss one of them if it wasn’t in the set. A change from Reading in ’87 was seeing a sea of cellphones waved in the air to capture ‘In The Army Now’ but otherwise not much has changed. Parfitt is still in jeans and T-shirt – only the gold ring in his ear hinting at wealth and the gravitas of being made an OBE. Rossi is more ‘formally’ dressed in a collared white shirt and black chinos but also toting only a glint of gold in his earlobe as testament to his impression on British Rock history. He still has the chops to deliver a super solo though as evinced on ‘Roll Over Lay Down’. His face is so animated on ‘Wild Side of Life’ that I’d swear he was singing with his eyebrows. It’s still light when they finish a blistering set with the statutory ‘Rocking All Over The World’ and round things off with ‘Rock n Roll Music’ and ‘Johnny B Goode’. It’s a point at which I would happily have gone on my way home with great music ringing in my ears and my head – but as the saying goes, the evening was still young. School was in fact out for Cooper some years ago of course and now he’s the teacher. Hopefully he will be playing shows like this one for a long time to come, because a lot of ‘musicians’ out there need to see how a live show is put on. They don’t all need to bring on guillotines and pythons and crazed Frankenstein figures, but they do need to know that a live show is a visual occasion. It’s all done strictly tongue in cheek of course. Well I hope so anyway, that scene where Cooper harpoons an onstage photographer with his cane was a little unsettling! 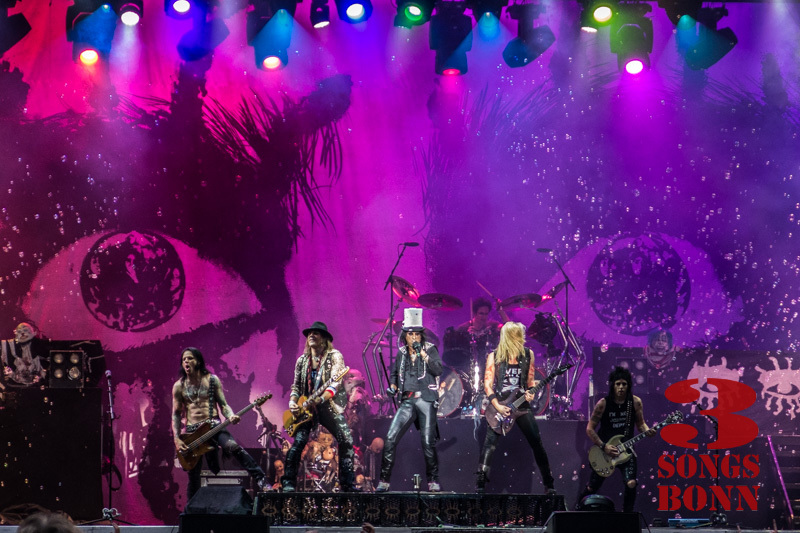 A nightmare courtesy of Alice Cooper wouldn’t be a nightmare without a bloody strait-jacket, a crazy nurse and of course a guillotine. Songs like ‘Be my Frankenstein’ and ‘Welcome to my Nightmare’ would be great tunes even without the theatrics. Certainly Coopers current band have the ability and the style to sizzle without any extra lightning evoked electric current. Ryan Roxie and Chuck Garric have been in the Band a good few years now and are heavy metal heavyweights in their own rights. 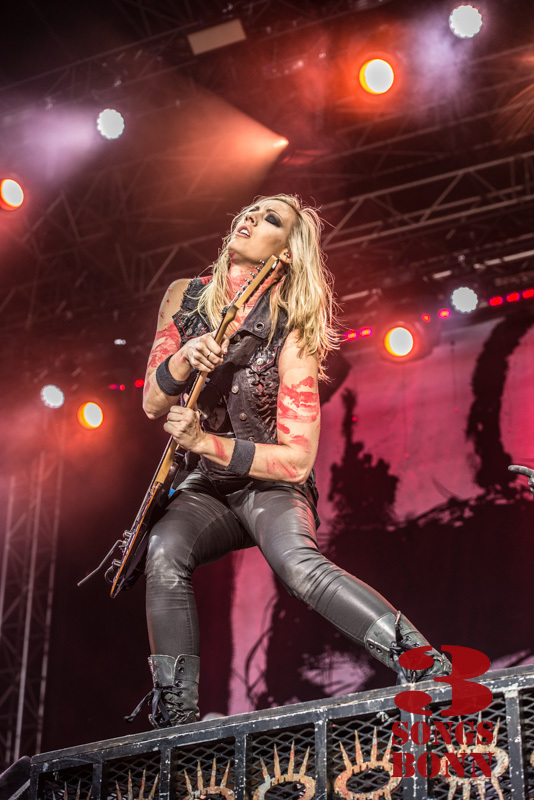 A newcomer was Nita Strauss, fresh from her place in an all-girl Iron Maiden coverband (called, surprise, surprise, ‘Iron Maidens’). Strauss is a whole lot more than eye candy though – that was a razor-sharp solo she tore out for the ‘tombstone’ section of the evening on Jimi’s ‘Foxy Lady’. Cooper actually does very good ‘takes’ of some of Rock musics ‘lost’ souls, donning round dark glasses for Lennon’s ‘Revolution’ and doing a credible ‘My Generation’ in memory of Keith Moon. I loved the self inflicted humour (intended?) of Alice belting out “I’m Eighteen!” whilst holding a bloodied hospital crutch. 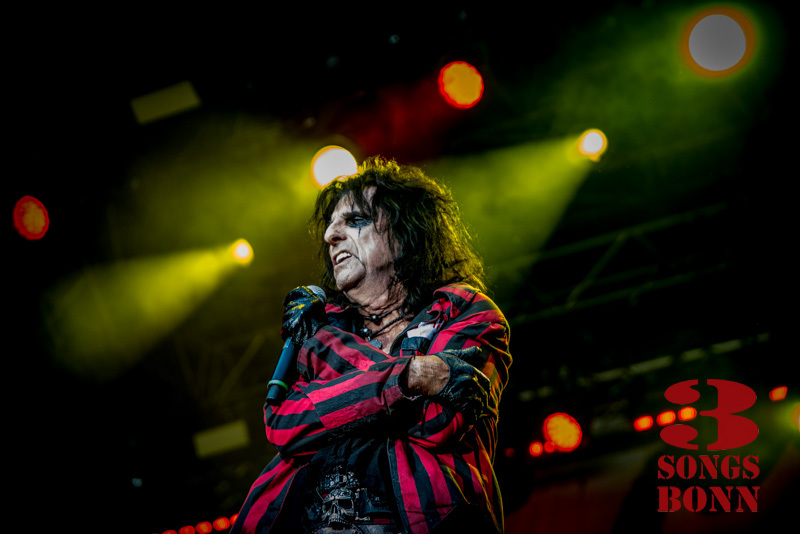 Time waits for no man of course but thankfully Alice Cooper is no man- he is, quite rightly, an American shock rock institution. Yes people, a night with Quo and Cooper was an expensive proposition in comparison to many other shows doing the rounds these days. But, we had over three hours of great music played by legends and with an intensity that is sadly lacking in a great many stage shows from the ‘young guns’. Hopefully some of them will have been amongst the crowd and will have gone home knowing a lot more about playing live music from two of the best live bands ever. 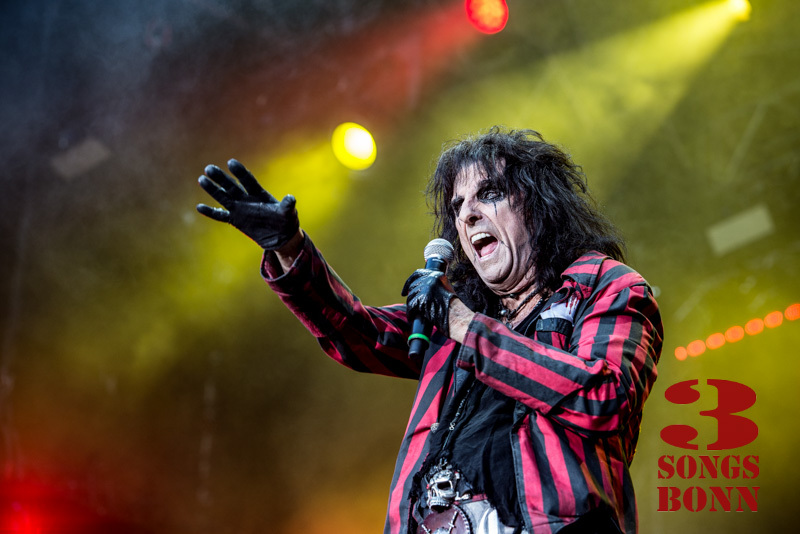 This entry was posted in Gig Reviews, News and tagged Alice Cooper, Bonn, Kunst!Rasen, Status Quo. Bookmark the permalink.